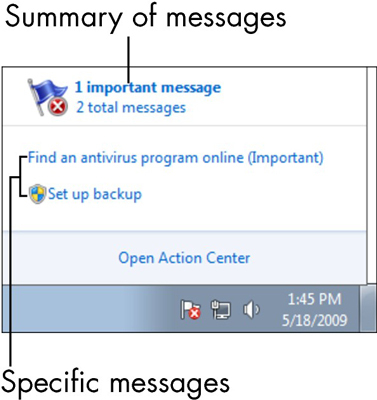 The Action Center is Windows 7’s primary means of alerting you to potential problems. 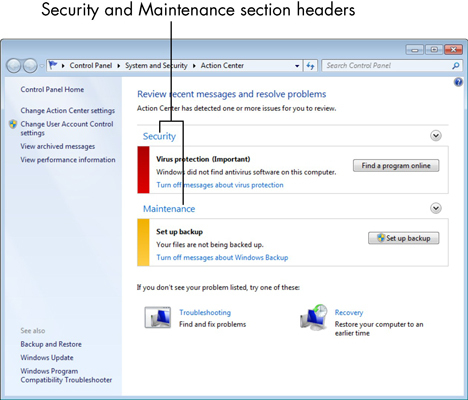 You can use the new Action Center feature in Windows 7 to stay informed of security and maintenance issues that need attention. 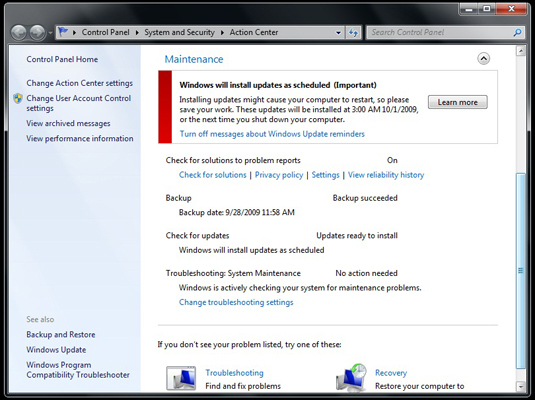 Most maintenance issues can be addressed by allowing Windows 7 to perform regularly scheduled tasks, such as backing up the computer. As for security issues, the most pressing concerns deal with the firewall and virus protection. The Action Center alerts you to issues by displaying an icon (shaped like a flag) in the notification area of the Taskbar. If the icon also has an X over the flag image, you know that the Action Center has a message for you. Click the icon to see a list of Action Center messages. An Action Center notification pop-up appears. In this case, there is both an important message and a less-important issue that needs to be dealt with. If you don’t see the Action Center icon in the taskbar, click Start and type action in the Search Programs and Files text box; then click Action Center from the resulting list. Click Open Action Center within the pop-up notification to see all of your messages. You can also click a specific message to see just those details. In some cases, the issue at hand is not relevant to you. If that’s the case, you can Turn Off Messages about the particular issue. Just don’t turn off a message until you’re sure you don’t want to come back to it later. 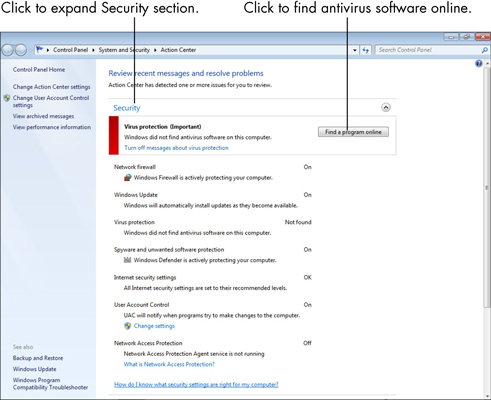 Click anywhere on the Security heading to expand that section of the Action Center. Network Firewall: The firewall scans Internet traffic and blocks activity from programs that don’t have explicit permission to use Internet access. Windows Update: Microsoft regularly releases security patches that can protect your computer from known security threats. Virus Protection: Having virus protection for your computer is essential. Microsoft offers its new Security Essentials for free, but there are plenty of other good anti-virus programs out there as well. Spyware and Unwanted Software Protection: If this service is on, you have basic protection from malicious software. Internet Security Settings: These settings pertain to your browser security. You might want to consider strengthening the default settings. User Account Control (UAC): This function notifies you of programs that try to make changes to your system and requires that you confirm any such changes. Network Access Protection (NAP): This service only needs to be turned on if your computer connects to a business network that requires NAP. Click the Security heading to collapse that section and click the Maintenance heading to see what that section includes. Among other options, Windows 7 likes to remind you to set up your backups. Check the Action Center weekly or monthly to see whether any new messages have appeared.